Over the past summer I made friends with my social movements professor. She’s an avid prison abolitionist meaning that she believes prisons ought to be abolished altogether. This past February I wrote an article in The Leveller titled Punishment at What Cost? in which I alluded to this idea that prisons actually do more harm than good. Prison is punishment. In a sense, imprisonment is an act of violence. If I were to abduct someone and lock them in my house, that would be kidnapping. Now, obviously prison has a different end. It finds justification through an assumed capacity to suppress possible societal dangers. However, this does not detract from the fact that forcibly confining someone is an act of violence, an act of ‘socially acceptable’ and federally enforced revenge. We ought to look for viable alternatives which better foster societal safety. 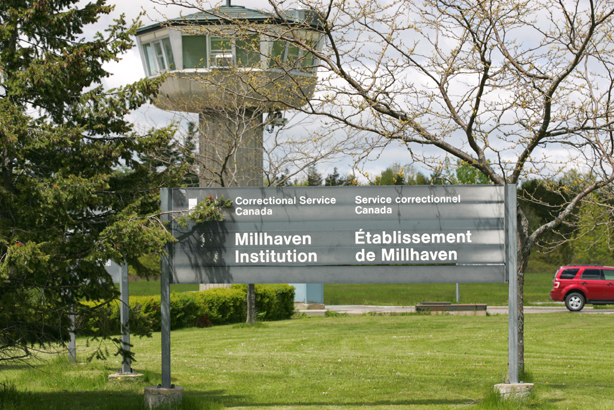 With that said let me talk about the trip I took to Millhaven Penitentiary on February 10th to visit a group of lifers. In Canada a life sentence is 10 -25 years. I took this trip with my professor and three other individuals as part of OPIRG’s Millhaven Lifer’s Liaison Group. I got up tired, skipped two classes and a midterm. I hopped in my prof’s car at uOttawa. The car is full of folks experienced and learned in the prison system and criminology. I’m sitting there, a third year philosophy kid, going largely because he cares, partly because he can’t say no to crazy opportunities. We ate mini muffins, took from the veggie platter and drank those funny little ginger-ale cans while making small talk for about two hours. The car made a couple jumps and bumps, the snow came down, but ultimately we arrived safely to meet the lifers. We were in the middle of nowhere when we arrived. We climbed with anticipation up a long driveway and the prison rose slowly over the horizon. the first thing that struck me was the fences, two of them, parallel, about 10 feet apart and about 15-20 feet high with aggressive barbed wire on top. Rifle towers sat at intervals around the several utilitarian buildings wrapped in barbed wire fencing. You know you’re no longer in civilian-land. We had to pass through a security checkpoint, which felt like an airlock into another world. The first gate opens. You stand there with some strange men in suits. The door behind us closes. The door ahead of us opens. We walk on. Entering the main building, there’s an obligatory picture of some old white guy in a suit next to a Canadian flag. I see prisoners for the first time but I mistake them for custodians. If you want to know what a prison looks like on the inside, just imagine your high-school but dirtier. It isn’t uncommon for the same architects to work on prisons, schools and hospitals. Next came the gruelling volunteer training. We’re shown what seems to be an ancient artefact—the very first PowerPoint presentation ever made! It’s repetitive, tedious propaganda. We’re told the prisoners are manipulative, we can’t help them at all and we can’t talk about anything that happens in here. Why are we here then? The prison’s volunteer coordinator, lacking certain sophistication stumbles over some big words making it hard not to laugh. We were to meet our lifers in the chapel. All of us would eventually be locked in the room together—just the volunteers and the lifers. We were reassured that there were guards behind the glass at the top of the room, equipped with rifles and some unspecified gas. We were safe! The book shelves were decked out with a funny mix of Christian literature and biker books. But the really striking thing was the mural on the wall. The wall was made of large bricks like you see in high-school, and the painting’s composition was just like a high-school wall’s. The mural featured a huge lake surrounded by snow-capped mountains covered in evergreens. It was the inspiring image they have been locked away from and can’t hope to see for God knows how long. The first man entered. Being alone with the four of us volunteers he was fidgety and a little awkward. I was too. He cracked some jokes to break the ice and told us he was surprised that we actually showed up. More men crowded in, 11 in total. They were allowed to wear their own clothes and as a result most were wearing snapbacks, sports shirts and baggy jeans. When I looked in their faces I saw poverty, they looked like my family who live in projects. I see the faces of the exploited, impoverished construction workers whom I used to work alongside. I see people. They were much more intelligent than I had unfairly stereotyped them to be. They were open and friendly. One was appealing his case, and could certainly pass the bar. Another was keeping up with my prof’s prison theory which I could hardly understand. There were even folks seeking university degrees from the inside. One very pragmatic gentleman was ardently seeking the administration forms that explained how he could move out of maximum security. It was general consensus that the documents are very hard to come by, either by staff negligence or intentional withholding. They told me the mental health unit, which the prison volunteer coordinator had pointed out, was where most of the solitary units were. That was maddening. The prison shuts down visits from April to September. This year they had not resumed the break until February and despite this extended break the staff still plans to end visitations in April of this year. Many of them haven’t seen their wives, children or families in months due to visitation cancellations and lock-downs. They’re locked up in there; nobody is looking in just as they can’t look out. I know a lot of people think these men deserve this. In all likelihood lives were taken and I am not making excuses for that. But while corporal punishment and lashing are barbaric and ineffective so is imprisonment. We don’t look at the goal of the justice system. Do we really want it to be about revenge? Doing to others as they did to us? Where is the moral justification in that? It costs $110 000 a year to keep just one inmate in the federal penitentiary system.3 Women cost almost double. Yet the cost of maintaining an offender in the community is 70% less. Imagine if those savings were put toward mental health services, alleviating poverty and programs which prevent crime. Imagine if we dismantled the drug war which only contributes to organized and violent crime. We seriously need to reconsider prisons as an effective way to keep a healthy and safe society rather than maintaining the status quo and consoling ourselves that just deserts have been served while human beings rot. At some point I would like to learn more about this topic. There is something called restorative justice and restorative circles that I was learning about at one point, there is a group that does Thursday evening call ins… anyways, you might be able to find some people to talk about this for next season’s cinema academica.